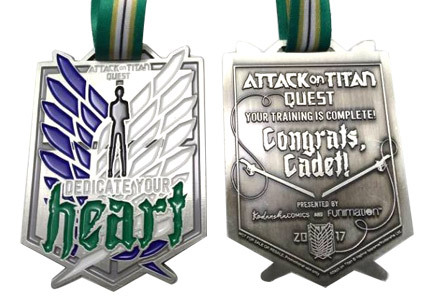 Kodansha Comics and Funimation are proud to present Attack on Titan Quest: Dedicate Your Heart #AoTQuest, a uniquely structured 2-part interactive quest set in downtown Los Angeles, based on the hit manga and anime series Attack on Titan during the week of Anime Expo 2017. OUTSIDE THE WALL can be played by anyone with a mobile device who happens to be in Los Angeles's Little Tokyo neighborhood. OUTSIDE THE WALL starts today June 27. INSIDE THE WALL takes place for Anime Expo attendees July 1-4 inside the Los Angeles Convention Center in downtown Los Angeles. Both "outside" and "inside" are completely free to play. And all Quest players, whether “outside the wall” or “inside the wall,” will receive via email a unique download code to redeem a free digital edition of the latest volume of Attack on Titan (volume 21) from comiXology. 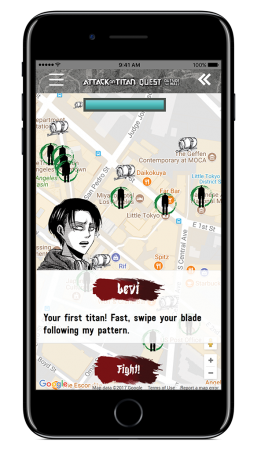 Join the Survey Corps and defeat the Titans in Little Tokyo! Captain Levi awaits you for training to survive outside the wall. You don’t have to attend Anime Expo to play. Just bring your mobile device to Little Tokyo in Los Angeles. The Kinokuniya bookstore might be a good starting point! New cadets wanted: the Training Corps are now recruiting cadets to play an SMS-based* scavenger-hunt mission inside of Anime Expo! Your favorite characters from Attack on Titan may help you along the way! 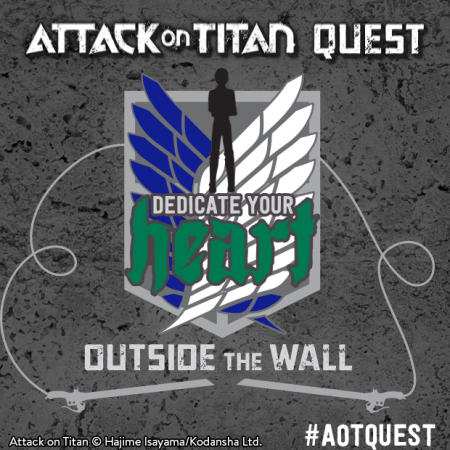 To join Attack on Titan Quest: INSIDE THE WALL, visit the Kodansha Comics booth (#1006) at Anime Expo! 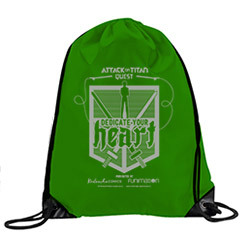 Participants can expect special messages from their favorite Attack on Titan characters! Check out the Attack on Titan Food Truck brought to you by Funimation! Experience the once-in-a-lifetime Attack on Titan Food Truck from 10 am to 8 pm every day during Anime Expo! Funimation is partnering with Mad Dumplings, a food truck that has been taking the SoCal streets with a delicious, creative spin on dumplings, and offering an Attack on Titan branded menu! Funimation is giving away a limited number of vouchers for the food truck at 10 am at the Funimation Booth #1800 each day, so don't miss out on your chance to get some free food!